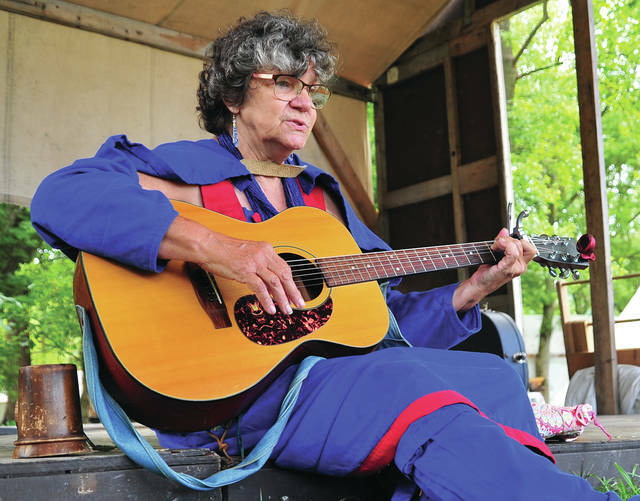 Jane Cassidy, aka Buffalo Woman, who describes herself as a “traveling nomad” plays a tune and sings in the mountain men encampment at Fort Rowdy on Saturday. 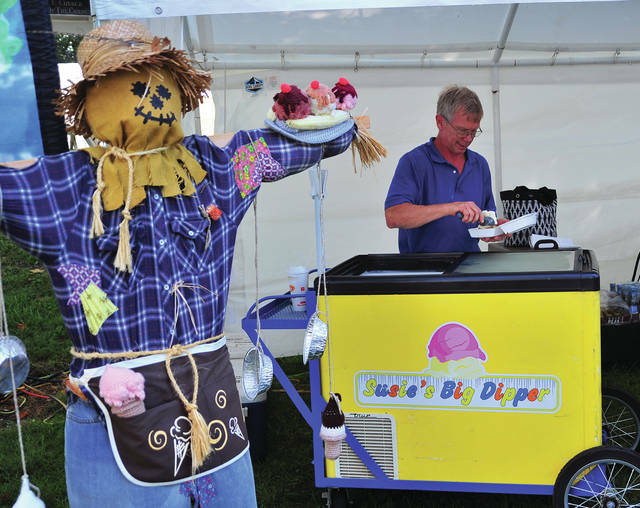 Wayne Pope of Susie’s Big Dipper in Piqua scoops ice cream during the Fort Rowdy Gethering in Covington on Saturday. Sweet Betsy performs on the main stage at Fort Rowdy on Saturday. COVINGTON — It is Fort Rowdy Gathering time in Covington this weekend and crowds gather on the banks of the Stillwater River renew friendships and pay homage to the pioneer spirit that helped shape our country. As the annual Labor Day-weekend festival kicked off on Saturday morning, guests were greeted by steady rain that fell across the region. That did not stop festival officials who held their opening ceremonies and welcomed campers and guests to the 2018 Fort Rowdy Gathering. While morning crowds were light as the weather slowed arrivals, there was a bustle of activity in the Mountain Men encampment as smoke rose from dozens of cooking fires and primitive campers went about their morning chores. Some were greeting their weekend neighbors while others worked on craft projects or put the finishing touches on shelters. Visitors to the camping area walked across the iconic Friendship Bridge, a temporary wooden footbridge spanning the Stillwater River. The sound of a hammer ringing on an anvil draws visitors to the Blacksmith tent where Dustin Baker of Tipp City uses an antique forge to create iron gifts that can be purchased on site. Tents and tepees line both sides of the encampment where visitors can get a first-hand look into life in this part of the United States during the late 18th and early 19th centuries. 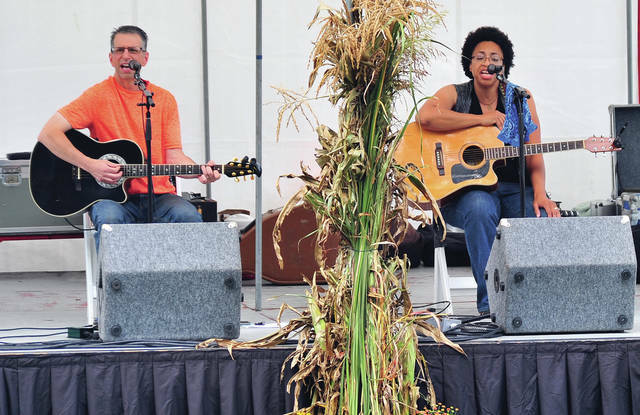 In the encampment entertainment tent, Jane Cassidy, who describes herself as a “traveling nomad” strums her guitar and sings tunes for guests who were seated on bales of straw. Back on the other side of Friendship Bridge, visitors to Fort Rowdy will find a variety of food and treats. The Newton Band Boosters have a booth as well as several area churches. The Fort Rowdy Gathering will continue on Sunday and Monday at the Covington Community Park just off US Rt. 36.